Oleksandr Usyk and Tony Bellew at the press conference to officially announce the "He Who Dares" promotion. 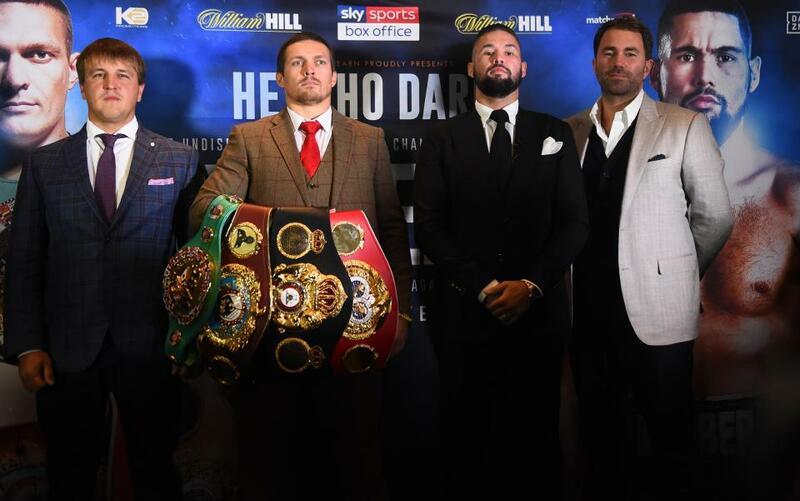 Former WBC cruiserweight champion Tony ‘Bomber’ Bellew has questioned undisputed cruiserweight champion Oleksandr Usyk’s ability to hang with the big boys at heavyweight. The 35-year-old Liverpudlian made the comments in an interview with iFL TV to promote his upcoming fight against the undefeated Ukrainian at Manchester Arena on November 10. Southpaw Usyk 15-0 (11) emerged from the inaugural World Boxing Super Series tournament with all four of the major belts at 200-pounds after entering the competition as the WBO cruiserweight champion. The 31-year-old has agreed to face Bellew for all the belts before a planned moved to heavyweight to fight in the sport’s marquee division. But the outspoken Briton remains to be convinced the 6-foot-3 Usyk can mix it with the bigger bodies at the upper echelon of the division. Bellew cited his friend, unified heavyweight champion Anthony Joshua 22-0 (21), as the type of boxer he believes will give Usyk all he can handle and more. “I think Ant is improving every time he gets in the ring. I really think he is slowly and surely turning into the finished article,” said Bellew. “He’s not the finished article just yet, but every time you watch him you can see him learning from every fight. “You can see now the things he did in the Parker fight he did in this fight, and he added the way to close the show. Bellew revealed that Usyk wanted to use this fight as an entry into the heavyweight division. “He wanted this fight to be at heavyweight. He’s just another man who wants to get at King AJ by going through the fat boy,” said Bellew, who weighed 210¼ and 213½ for his brace of victories over Haye. Usyk defeated Marco Huck, Mairis Briedis and Murat Gassiev to claim the Muhammad Ali Trophy and universal recognition as the best cruiserweight in the world in the opening season of the World Boxing Super Series.